The Narrogin Chamber of Commerce is proud to represent a large membership of local businesses operating within Narrogin and its surrounding shires. Our member base covers the full spectrum of business size and industry classification. NCC relies entirely on annual membership fees to fund all of our operations, activities and promotions throughout the year. 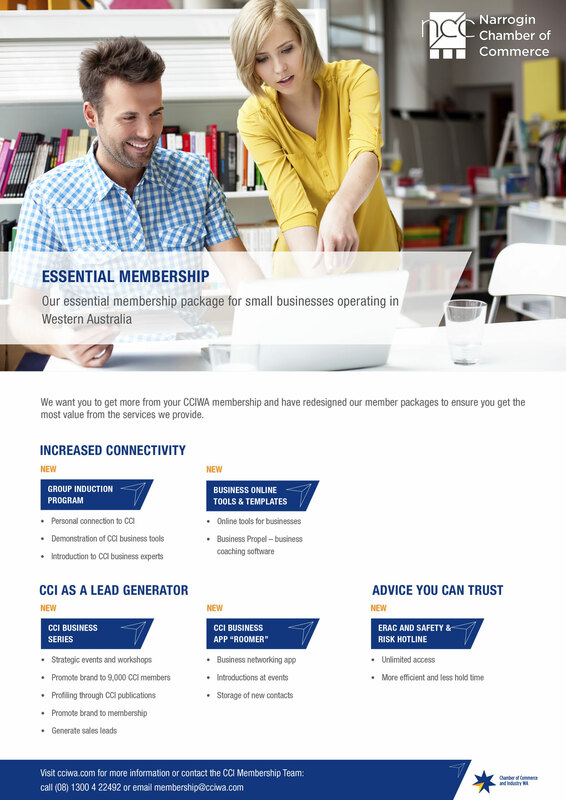 Why become a NCC member business? The more members we have, the stronger we are and the more we can achieve. Your support will help us continue to advocate for the interests of local business and provide our members with the benefits outlined below. • Weekly Business Bytes electronic newsletter. NCC members with more than 30 employees are eligible for a 25% discount off their relevant CCIWA membership fees. RCCIWA is made up of 41 individual regional Chambers and Business Associations – representing over 7000 member businesses located throughout Western Australia. RCCIWA provides a unified voice for business in regional WA, and serves to promote, develop and support all regional Chambers and Business Associations across the state. In 2017, Narrogin Chamber hosted 'Meet the Candidates', a special Business After Hours meeting attended by Liberal Party, National Party and Australian Greens candidates in the Roe Electorate and Agricultural Region. A popular referral channel and information source for enquiries regarding local services and member businesses. Involvement in regular marketing promotions coordinated by NCC, such as the highly successful Christmas 'Shop Local' promotion and gift certificate campaign.